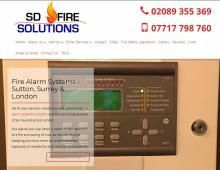 SD Fire Solutions based in Surrey boast a team of highly skilled technicians that specialise in the supply and installation of fire alarm systems in Sutton and the surrounding areas. Covering Sutton, Croydon, Carshalton, Wimbledon, Epsom, Surrey and London, SD Fire Solutions also offer a professional range of intruder alarm systems in Surrey and fire alarms in Croydon & Sutton to suit your home or business. If you are looking for a fire risk assessment in Surrey, fire extinguisher servicing, fire alarm installation or intruder alarm systems in Surrey or London, contact SD Fire Solutions for a quotation.